In 1834 two Aboriginal men led John Jauncey, a young convict, to suitable grazing land in the Tilba district where he took up the Tilba run for his employer George Curlewis and his stepbrother Septimus. A site was chosen for huts and yards on the clear hills where Mountain View property at Tilba Tilba now stands. 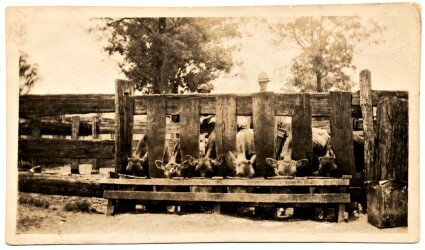 In 1843 in partnership with Septimus, Jauncey purchased the property and started the first dairy and pig farm at Tilba. By 1847 they had 150 dairy cattle and produced 1000 pounds of butter. The butter was put in wooden casks and sent to market by sailing ships from Bermagui. When Henry Jefferson Bate, his eldest son, Samuel, and David Kerr took up land in 1868 under the Robertson land act, grazing and dairy farming became firmly established. They were soon followed by the Seccombes, Reads, Crapps, Hoyers, Southams and Neguses. By the mid 1870s cheese was being produced on some home farms while milk from others was sent to their neighbours to be “made-up”. Cheese making required greater skill, was less competitive in the market, easier to handle and had a longer shelf life than butter. Pigs were fattened on the whey, a by-product of cheese production and provided a profitable sideline for the farmers. By the end of 1891 farming was focused on cheese production with 27 farms on 9000 acres supporting about 350 people. The ABC Co-operative Cheese Factory was opened in 1891 and by the end of December that year 26,000 gallons of milk had been delivered and 650 cheeses produced with the ABC brand. But due to the state of the roads and the distance from their farms it wasn’t economical for some farmers to supply the new factory. Within the next 2 years, the Tilba District would boast three co-operative factories as well as several on-farm factories. The ABC Cheese Factory was privately sold in 1972. Cheese production is back in production today under the guidance of Erica Dibden. Traces of gold were found by Rev. W.B. Clarke in 1852 and by 1860 there was a small gold rush to Mount Dromedary. 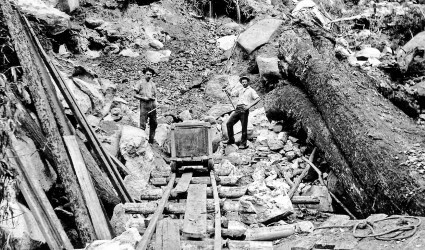 Gold mining propelled Tilba Tilba’s development and by the mid 1870s, more than 150 men were working on the mountain. Despite difficult living and working conditions, and the opening of the nearby Montreal Goldfield in 1880, mining continued into the first decade of 1900. Tilba’s Tilba Tilba was the focal village servicing the farmers and miners of the area until 1895 when Samuel Bate sold allotments carved from his property up the hill, creating the alternative village of Central Tilba. The new village expanded steadily, gaining a courthouse, police station, hotel, two butchers and other businesses. 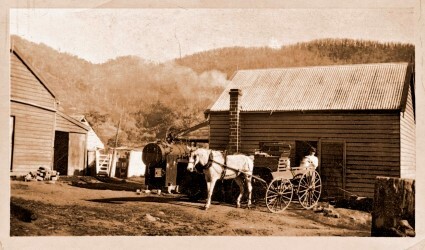 When its post office lost its official status in 1906, just as gold mining was drawing to an end, Tilba Tilba could no longer compete with Central Tilba. A significant photographic record of the Tilba district in the years from 1890 to 1910 was created by Tilba Tilba resident William Henry Corkhill, using his half-plate camera and glass negatives. This unique archive can be viewed at the Bermagui Museum. 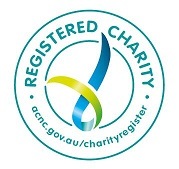 The Bermagui Historical Society is a registered not-for-profit charity organisation run by volunteers. Operating expenses are funded by donations and fundraising. Keep up to date, contact us, or follow us on our Social Networks. Please visit our Sponsor Page.